Tuesday 24th November -Market wrap | Beeks Downunder-Because not all financial news is boring! ASX 200 closes down 50 points to 5226.4, on its lows as across the board profit taking kicks in. BHP -1.79% and other resources were again a target as the sell-off in commodities continues. Asian markets were mixed with China down 0.9% and Japan back online up 0.2%. US futures up 4. A broad sell-off was always on the cards as the continuing commodity falls take their toll. Our market has rallied hard since the aftermath of the Paris attacks only a week ago and was due a rest. The Treasury department downgraded its economic outlook this afternoon and this pushed the market down into the close. We tried a couple of times to lift but in the end the fatigue took its toll and the profit takers stepped back in accelerating into the close. A low of 5226 and a high of 5267 today. 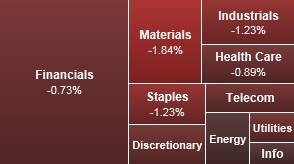 Financials were weaker on profit taking with banks down around 0.5-1%. Australia and New Zealand Bank (ANZ)-0.29% tried to buck the trend but failed in the match out. Insurers including AMP -2.04% and IAG -1.05% weakened and Macquarie Group (MQG) -1.22%, the worst performers in the big caps. Flexigroup (FXL) -2.46% as it closed its retail entitlement offer with a take up rate of around 95%, raising $150m in total. Resource stocks were once again sold down with BHP -1.79% slipping below $20 again as Standard & Poor’s has reaffirmed its A+ Credit rating as it see no immediate effect from the Samarco tragedy. RIO -1.48% while mid-caps were once again sold off aggressively. Fortescue Mining (FMG) -3.21% gave up yesterday’s gains as didIndependence Group (IGO) -6.27%, Iluka Resources (ILU) -6.88% and Western Areas (WSA) -5.29%. 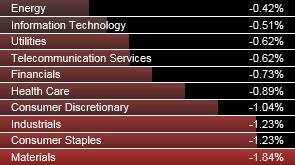 The whole sector is getting oversold but there is no catalyst to cause shorts to cover so the trend remains down. Energy stocks were mixed as Santos (STO) +0.75% celebrated the end of the rights trading period and rallied against the trend. Others were not so lucky, Woodside(WPL) -0.97%, Oil Search (OSH)falt and Origin Energy(ORG) +0.18% slightly better. Utilities and infrastructure stocks were sold down slightly to make way for theTransurban (TCL) rights issue. Sydney Airports (SYD)-3.22%, APA Group(APA)-1.62% and Qube (QUB)-1.25% after the AGM commentary initially turned sentiment positive. Woolworths (WOW) -2.35% gave back some of yesterday’s media inspired gains, bringing Wesfarmers (WES)-0.61% down with it. Healthcare stocks suffered as Healthscope (HSO)-6.71% was weighed down with the private equity placement today and news of a new contract with Medibank.Mesoblast (MSB) -8.14% continues to remain friendless despite an investor update.Mayne Pharma (MYX) -5.6% slipped as did animal healthcare stock Greencross(GXL) -3.88%. The Lazarus stock of the day is Lynas Corp (LYC) +8.7%. Beaten up and left for dead a few months ago, the stock has done nothing but rally after the AGM comments yesterday. This has become the classic cost out story with production costs down 25% and a 40% reduction in overheads. It seems too that falling freight rates for bulk commodities is helping cost cutting as the material is shipped from WA to Malaysia for processing. Stunning performance again from the cream of the dairy sector, with A2Milk (A2M) +9.36% although off its high of around 15% up. This follows the sale very recently of Freedom Foods’ remaining stake at 85c and the stock has not looked back since. Other stocks in the clean and green theme story Bellamy’s (BAL) -0.38% slipped slightly on profit taking with Blackmores (BKL)-1.35% following suit. Select Harvest(SHV) -7.15% was a big loser today as fears of the El Niño impacts continue. Others in the sector gave back some of the gains too, Bega Cheese(BGA)-0.17%,Warrnambol Cheese (WCB)-1.96%, Australian Agriculture (AAC) -1.34% and Elders (ELD) -2.16%. The speculative stock of the day was Odin Energy (ODN) +1500% after announcing a potential deal to buy gridComm Pte Ltd, a Singaporean company that has the technology to create a data network over the city’s power lines to enable street light control. GridComms software and systems have the potential to save up to 50% of power and maintenance cost. Harvey Norman (HVN) +0% has avoided a second spill motion after 94% of shareholders voted in favour of the remuneration report. Gerry Harvey said pre-tax earnings had risen 27.8% in the first quarter and told shareholders the company is ‘going really good’. Wipeout! Billabong (BBG)-22.86% fell hard after the company forecast EBITDA in the first quarter to be around $2.5m below the same period last year. The company blamed the weak update on challenges in the US market and currency pressures, as most of its debt is in USD. TPG and Carlyle private equity groups have sold out of their holding in Healthscope(HSO)-6.71% this morning. All the remaining 308m were sold in a block trade at 277c. Technology One (TNE) +0.5% announced revenue expectations up more than 200% in the last 12 months. Net profit after tax for the software-as-a-service (SaaS) business jumped 16% to $35.8m and revenue was up 12% to $218.7m for the full year to September 30. Consumer confidence continues to be volatile, with the ANZ/Roy Morgan weekly index falling 1.2% last week. The trend remains higher as the Turnbull effect continues to buoy sentiment. The value of loan approvals for property investors fell 20% from $40.55bn in the June quarter to $32.39bn in the following three months, APRA said. Loans to property investors made up 34.9% of new lending approved in the quarter, which was the lowest share in two years, and down from 43% in the June quarter. Treasury has cut the nation’s potential economic growth rate by around half a percentage point to 2.75% because of weaker population growth, worsening the likely outcome of future budget deficits. Deficits deeper for longer now the new black. Forecasts now from two big investment houses on the trajectory of US rate rises next year with Goldman Sachs suggesting one a quarter where RBC has forecast a rise at every other meeting next year. To quote Sir Humphrey Appleby, ‘That would be very courageous minister’. Glenn Stevens is due to address the nation’s economists tonight at a dinner entitled ‘The Long Run’. Expect plenty of riveting speculation tomorrow on what the RBA intends to do with interest rates. Looks like China is set to remove the limit on brokers’ proprietary trading. After the mega merger of Botox and Viagra was announced last night, there will be some fallout as this tax driven deal will galvanise politicians to look at these so called inversion deals. Expect more chatter on tax haven treatment to enable better tax treatment for these behemoths. More problems for VW as they are now admitting to a second illegal device in their Audis. And finally for all stock market followers, one constant over the last 60 years has been the Dow Theory Letters from the famed writer Richard Russell. Sadly, Russell died yesterday aged 91. The newsletter will go on uninterrupted.